I have upgraded my Ubuntu 10.04 to Ubuntu 10.10 beta. 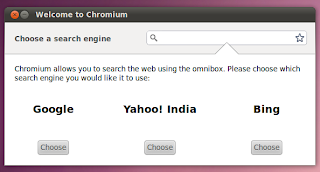 Chromium Web Browser was the first thing I installed in my new upgraded Ubuntu 10.10. 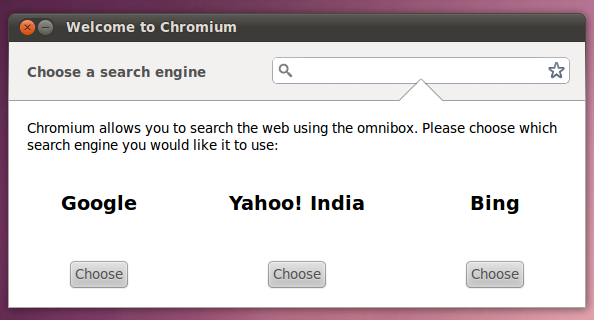 When I finally launched Chromium, it had a small surprise in store for me. Chromium prompted me with a choice of popular search engines I could use. Chromium and Google Chrome had this feature in a more subtle way before. It never blatantly asked the user to choose the search engine of choice. But interestingly, I didn't saw this feature in the new Google Chrome 6. So is this a feature only for Chromium? Most probably. How is Google Chrome different from Chromium?